I’ve just finished reading Rosie Goodwin’s The Misfit and what a good read it turned out to be. I was hooked from the very first moment and couldn’t wait to discover what happened to Rebecca, the central character. The Misfit is all about Rebecca and it seems that she is just that – a misfit – through no fault of her own. She was abandoned at birth and subsequently adopted. However, she always felt that she was not attractive enough to live up to both parents’ expectations. Tragedy strikes though when both adoptive parents die within a few months of each other when Rebecca is only seven. She goes to leave with her abusive uncle and money grabbing aunt but when that does not work out there follows a stream of foster parents – none of whom manage to cope with her. She finds some contentment when she joins up with a circus but it seems that there is more tragedy and heartbreak awaiting her. Will she ever be able to find the peace and happiness that she deserves? I think The Misfit is a wonderfully written book and I was gripped from the very first page. The story is very involving and it is impossible not to feel bad for Rebecca as one reads about her plight and I think that Rosie Goodwin has created a fascinating and feisty character. There are also lots of things happening and the story moves along at a good pace always keeping the reader’s interest. It starts back in 1988 when Rebecca is born and moves forward in years stopping at key moments in her life. The Misfit is also an incredibly moving book and there are moments that may well have you reaching for the tissues. It is particularly moving because it explores what it must be like to feel unwanted and unloved – sad enough for anyone but particularly so for a young child. It also shows how, when someone such as Rebecca feel that is the case, that they can easily make the wrong choices in life by misinterpreting the situations they find themselves in. I found this aspect of the novel quite fascinating. It is also quite traumatic in places and some of the incidents that occur are disturbing. If you like your reading to be light-hearted and relaxing, this is probably not the book for you. On the other hand if you like a well written, thought provoking story with sympathetic characters, The Misfit could be just the book you are looking for. 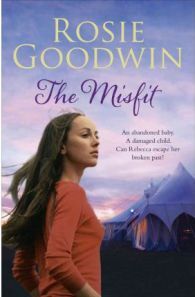 Overall, The Misfit is a fabulous read and has made me want to read much more from the author, Rosie Goodwin. No Comments on "The Misfit"